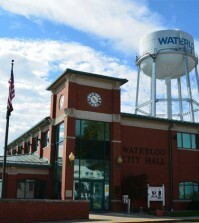 The Waterloo City Council on Monday night approved its 2014-15 fiscal year budget with slightly less expenditures than the previous year. Estimated receipts are $30,681,191 and estimated expenditures are $30,185,793. Last year’s budgeted expenditures were $30,585,775. General fund revenue is budgeted at $7.8 million, an increase from fiscal year 2013-14. The general fund’s largest source of revenue, sales tax revenue, is projected to decrease slightly based on recent trends. The city’s electric fund makes up 44 percent of the city’s budgeted disbursements. City finance director Shawn Kennedy said significant projects included in the budget are the purchase of a tub grinder and tandem dump truck, final payment of Moore Street improvements, resurfacing of the park and ride lot, Lakeview Drive curb and gutter and sidewalk improvements, Vandebrook Drive road improvements and a CAD system for the police department in the general fund, and relocation of utilities related to the widening of Route 3, the electrical building at the sewer plant, substation modifications and construction of an electrical line to tie into Ameren in the utilities fund. 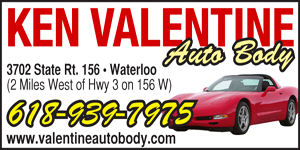 viewed on the city’s website, www.waterloo.il.us, by clicking the “Finance” portion under the “Departments” heading on the main page. In other action, the council approved an increase in the monthly household charge for trash pickup to $14.48 per its contract with Reliable Sanitation. The council also approved a Park Street business permit for a screen printing business at 411 Park Street, Suite A. Following a presentation by Waterloo resident Ed Weilbacher, who serves on the project team of Heartlands Conservancy’s “The Mounds: America’s First Cities” feasibility study, the council approved a letter of support for the effort. Weilbacher explained that the goal is to gain National Historical Park or National Monument status for Cahokia Mounds. As part of this effort, the project team is including all of the various mound sites in the surrounding region, including this area. For more on the project, visit online at www.Facebook.com/TheMounds. The council also approved the reappointments of Todd Osterhage to the Police Pension Board and Dennis Lenhardt to the Board of Police Commissioners.